Discover a hydrating self tanner with the SKINNY TAN Tan and Tone Oil in Dark; a fool-proof formula that adds moisture to skin, whilst delivering an enviable deep tan with a hydrated and dewy finish. 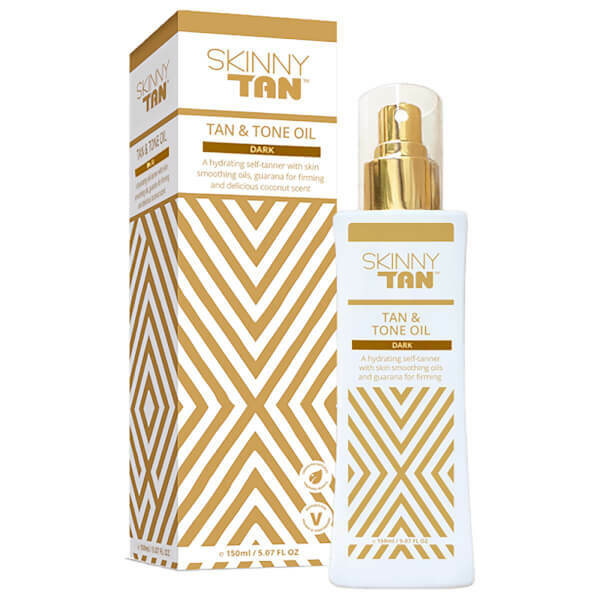 Simply misting onto and smoothing over the body, the tanning oil provides the most effortless solution to achieving a beautifully even, completely streak-free glow. The silky formula is enriched with a natural tanning agent, an array of organic oils and Guarana Berries, which work in synergy to deliver a veil of essential hydration to skin, whilst visibly firming skin to leave a supple and youthful appearance. The tan should be left to develop for six hours or overnight, and can be layered onto an existing tan to deepen, darken and maintain the colour without allowing any streaks. Simply spritz, glow and go. Aqua, Glycerin, Dihydroxyacetone, PEG-40 Hydrogenated Castor Oil, Dimethyl Isosorbide, Paullinia Cupana Seed Extract, Cocos Nucifera Oil, PEG-7 Glyceryl Cocoate, Ethylexyglycerine, Phenoxyethanol, Xanthan Gum, Sodium Metabisulfite, Parfum, CI14700, CI19140, CI42090, Coumarin.